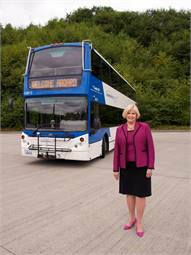 After leading Everett, Wash.-based Community Transit for 20 years, including the past five steering the Snohomish County public transportation agency through the recession, Joyce Eleanor will step down as CEO on August 12. Eleanor is the longest-tenured leader of the six Puget Sound transit agencies, a group that meets monthly to coordinate planning and scheduling. July 5 marks her 20th anniversary with Community Transit. Eleanor presided over unprecedented expansion of transit services in Snohomish County, including the introduction of the nation’s second fleet of double-decker buses and the state’s first bus rapid transit line, Swift. In 2000, Eleanor launched the Van GO program, which awards surplus vanpool and service vans to local non-profit agencies that demonstrate how they can use the vehicles to fulfill a transportation need. The program has awarded 106 vans and wheelchair-accessible mini-buses to Snohomish County non-profits, and Van GO has been replicated at transit agencies nationwide. Eleanor also led Community Transit through two funding crises and service cuts. The first was brought on by passage of I-695 in 2000 and subsequent state withdrawal of motor vehicle excise tax funding for transit. That year, Community Transit lost about a third of its funding and was forced to cut service, including all weekend service. After a successful vote to increase transit’s portion of the retail sales tax in 2001, the agency restored service throughout its district. In 2008, Community Transit saw a 20% drop in its sales tax revenue due to the recession. The agency raised fares, reduced spending and was again forced to cut service, including suspension of Sunday and holiday service. Due to those early actions to balance Community Transit’s budget, the agency is growing, with a modest service increase taking place this fall and a more significant increase planned for 2015. After becoming one of the first women to lead a U.S. transit agency when she took over MIDTRAN in Midland, Texas in 1979, Eleanor moved to the West Coast and was hired as executive director of Community Transit in 1994 following the resignation of its previous director. She quickly made her mark on the agency, and Snohomish County, by increasing local bus service by 55% and ridership by 56% in her first five years. Over the next 15 years, Eleanor continued to push Community Transit to the forefront of transit service, working to initiate a regional fare system and eventual smart card program, now known as ORCA, and a transit technology project that outfitted all buses with GPS technology to allow for better dispatch operations and a real-time bus tracking system now in testing. Eleanor served as president of the Washington State Transit Association (WSTA), a statewide advocacy group, when the last major state transportation funding package was passed in 2005. She also testified before a Congressional transportation subcommittee in 2010 on the use of federal stimulus funding to provide local jobs. Funding from the American Recovery and Reinvestment Act (ARRA) of 2009 helped purchase Double Tall buses and build the Mountlake Terrace Transit Center. Eleanor is a founding member of The Bus Coalition, a group of transit agency directors advocating for increased federal bus funding. She has served as APTA Vice-Chair of Bus and Paratransit Operations and she is also a past member of the Washington State Department of Transportation Office of Transit Mobility Advisory Committee, the Snohomish County Green Ribbon Climate Task Force and served on the boards of the Everett Area and South Snohomish County Chambers of Commerce and the Snohomish County Economic Development Council. Eleanor is a longtime board member and was the 2012 Campaign Chair for United Way of Snohomish County. She also serves as a member of the board for the YMCA of Snohomish County. She plans to spend time with her daughter and two grandsons who are moving back to the region this summer. The Community Transit Board of Directors plans to conduct a national search for a permanent replacement. That process is expected to take about six months. An interim CEO will be named in the next few weeks.